Coffee Pot Stamping Cafe: Imagination Abounds! 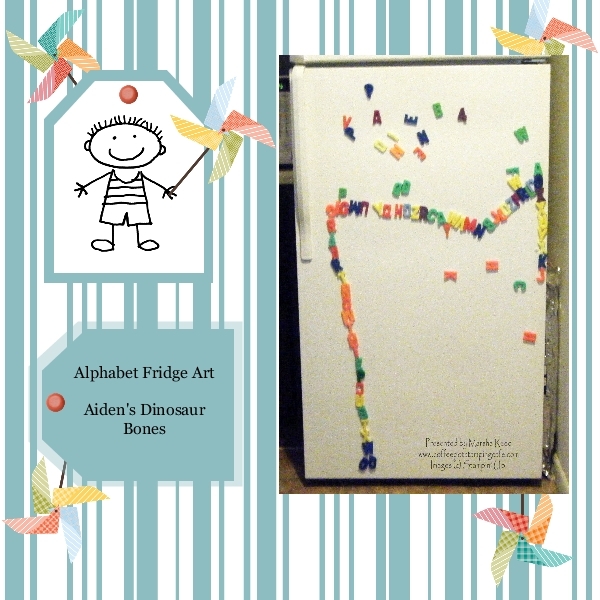 The other day Aiden and I found a bag of magnetic letters in Grandma's cupboard. His eyes lit up and he had all the fun of putting them on the front of the refrigerator. Each day he goes in and plays with them after his nap. His three year old imagination runs wild and I love the pictures he draws and the stories he tells. Yesterday he came up to me and asked me to come look at his dinosaur bones. This is what I found. My Digital Studio makes it so easy to add another page to the scrapbook dedicated to my grandchildren. So many memories can be shared with them through these pages.